I remember loving the Halo series. I remember investing hours in replaying the campaigns on harder difficulties, sometimes with friends and sometimes solo for the extra challenge. I remember smiling menacingly at killstreaks in multiplayer and throwing grenades right on top of banshees and long missions I thought would never end. But these were all memories from up to a decade ago, and as memory retention goes, mine is frankly pretty abysmal. But, like catching the scent of an ex-boyfriend's cologne you once knew, it turns out it was fairly easy to bring those memories rushing back again. Now that I've been able to spend some time with Halo: The Master Chief Collection, I feel like it's bridged the distance between today and when the games first came out. I don't just remember thinking how much I appreciated the perfect balance of clusters of enemies Bungie constructed—you know, the handful of grunts with a few elites, the tougher enemies that sometimes came in twos—I'm experiencing it all over again. If you've ever watched a movie a second time over, you might notice the little details that add more substance than you'd think they would. In a similar way, I didn't just rediscover things I knew I liked about Halo—I found and remembered new ones. Bungie, for instance, knew how to make you feel like the seven-foot-tall Spartan you are. Every marine is wowed by your presence. They can't believe they're fighting by your side. They feel safer, cheerier with you around. Grunts run squealing from you, crying out about the demon the Covenant fears so much. Playing through the Halo games again was easy, natural. I had the familiar instinct to pelt enemies with bullets as I ran up to them to finish the job with a melee strike. I swiveled the Warthog around carelessly, making completely (not) graceful landings over hills I totally meant to jump over. They were as familiar as if I had last played the Halo games a year ago, even if—redone graphics or not—Halos 1-3 still looked like older generation games. But now they have the added benefit of being freshly planted into my fingers as well as my mind. Up until recently, those memories were all vapors—a collection of feelings that was mostly beloved just by virtue of them having once existed. Replaying through four of Master Chief's tales over again gave me a solid reason to re-affirm my love for the series. Now I don't just recall enjoying those games, I know I enjoy them. And now I've enjoyed them in HD, too. So far I've spent the majority of my time with the collection with Halo 2, as 343 spent the most time polishing that game for its 10-year anniversary. Cutscenes are entirely redone by Blur Studio—the audio for everything from gunfire to the soundtrack drastically improved. On the whole, the visual improvements are relatively impressive compared to their original counterparts, but nothing like what we're getting used to on current generation consoles. But those cutscenes are an entirely different story. Swapping back and forth from new to old school renditions of the cutscenes was night and day. One entirely unanticipated bonus to the ability to switch between old and new graphics in Halo 2—just like in Halo 1's first re-release—is a tactical advantage. On the surface, textures, shadows and lighting have been added and modified. Certain design liberties have been taken overall, but that means that enemies are sometimes better lit in the older version of the game. This is especially true for cloaked Covenant creatures, where they're almost entirely invisible in the new Halo 2. I expected that the Master Chief Collection would be an enjoyable trip across a nostalgic era of gaming in my life. But the inclusion of the playlist feature amplifies that effect by mixing chapters by themes, and even between Halos 1-4, giving you an entirely new frame of reference for the experiences you had up to a decade ago. 343's managed to stitch the games together in unexpected ways, giving it new life. The first playlist I tried out is called Final Four, and it's pretty self explanatory: you play through the final chapters of each of the Halo games. Watching the Halo games change mission to mission, in what feels like one "game," is odd to wrap your head around. It's such a stark contrast to watch the Halo games change through the years, but just over a few hours. 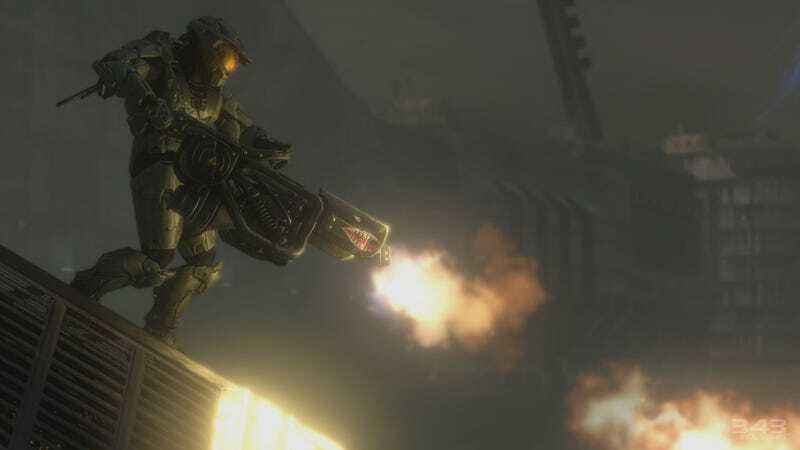 I thought back years ago and recalled the first time I had to decide to forgo my grenades in favor a newly-featured dual-wielding option, and how the needler weapon really shined in Halo 2. And then, soon after, I was juggling various equipment that granted my Master Chief extra abilities in Halo 3. I remembered how much Halo had changed, and how much it didn't—how it retained a lot of the core of what made it such an enjoyable shooter experience, and how I'd always try to push Wraiths and Warthogs and Scorpions into places they weren't meant to go, no matter which Halo it was. Or how nothing was cooler than jumping, on foot, to steal a Banshee out of the air. All those great, memorable, "Halo" moments were mine to rediscover, and to compare side-by-side, throughout the years but in one sitting. Some playlists will even let you focus on the vehicle-based missions, if you're in the mood for ultimate destruction. Or, if you need some brushing up on Halo history, you can re-experience the timeline of the story, strung together thanks to those dedicated playlists 343 put together. It's the difference between watching a show as it airs, throughout the span of a few months, or watching it all in one delightfully shameless binge session. It almost gives you a renewed understanding and appreciation for the story, if you're into that kind of thing. In Halo 2, you can experience only the Arbiter's storyline, or just Master Chief's. You can decide to play through all the Halo ring missions. Or you can choose to fight the Flood, one mission after the next—though I have no idea why you'd do such a thing to yourself. I, sadly, haven't been able to play any multiplayer yet, mostly because the collection won't be released until next week and multiplayer just isn't the same without its public servers. But I can't wait to find Halo's multiplayer servers repopulated again, to play through favorite maps and rediscover some of the exploits that 343 decided to leave in for old time's sake. The Halo series released at an interesting juncture of my relationship with games. I was in high school and didn't know any fellow gamers at the time. Gaming was my silent hobby. I grew up playing games with my cousins and my brothers, but I was mostly on my own come high school years. None of my friends knew what a "first-person shooter" was, let alone "Halo." Most of my gaming experiences, therefore, were fairly lonely. But Halo initiated a different kind of pattern for me and games. I eventually played co-op with friends I'd made online playing through rounds of multiplayer and kept that habit up, through the years and through different games, until I'd made real-life gamer friends of my own. I knew the re-release of one of my most played franchises in a package like this would be an exciting opportunity to relive all those experiences, and now to possibly do so with some of those aforementioned real-life friends. But there's another very good reason for why the Master Chief Collection is worthwhile, and it's one that's relevant to replayers and first-timers alike. The collection, as seen through the eyes of many sets of playlists, is everyone's opportunity to enjoy Halo exactly in the order and fragments they like. Can't finish a mission? No problem. Hate the Flood? Can't blame you. Just feel like reliving the glory days of early Halo multiplayer? Sure. That's just fine, too. Even Frankenstein Halo is a good time.